Last weekend, I had the pleasure of watching the show “Taylor Mac’s Holiday Sauce” at the Curran Theater with my friend Liz. 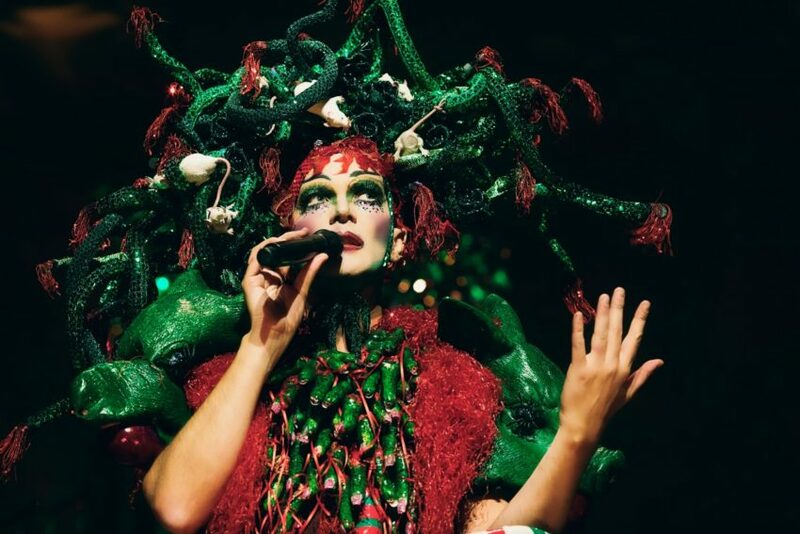 Taylor Mac is a performance artist, drag queen, singer, and MacArthur Fellow. “Holiday Sauce” takes a fresh, critical, queer / liberal / feminist view of Christmas traditions and music, as told by a fabulous drag queen. It’s exactly what I needed to kick off my holiday season. What does this mean? Taylor Mac explained that when you are a drag queen performing in gay cabaret shows, people will try and steal your spotlight. You have to be prepared to do what it takes to get the spotlight back. You might be singing your little songs with your little ukelele when a couple in the front row start engaging in sexual relations. “No matter how well you play that ukelele, you can’t compete with a [sexual act],” Taylor declared. I’ve been thinking about the phrase and the meaning for days now. To me it’s about being the director of your own movie, rather than just playing a bit part in someone else’s production. It’s owning your own power, no matter who or what is trying to take power from you. For many years, my biggest ambition was to hide in the shadow of someone who inspired me, to be the assistant or the aide-de-camp. I realize now that I was afraid of being in the spotlight, of being noticed. I’m done with that. I’m taking back my own power. I’m embracing my inner drag queen. I’m ready to be the boss. Where’s my damn spotlight?